Recombinant fragment corresponding to Human LYVE1 aa 24-232. Recombinant human soluble LYVE1 fragment produced in insect cells (ab54341). Protein-A Chromatography (+his tag depleted). The lymphatic vasculature forms a second circulatory system that drains extracellular fluid from the tissues and provides an exclusive environment in which immune cells can encounter and respond to foreign antigen. Recently a number of interesting molecules have been identified that may be exploited as markers for lymphatic endothelium, including the hyaluronan receptor LYVE1, PALE, VEGFR3, podoplanin. Our Abpromise guarantee covers the use of ab10278 in the following tested applications. IHC-Fr Use a concentration of 6 - 30 µg/ml. Fix sections for 10 min at -20°C in MeOH. WB Use a concentration of 1 - 2 µg/ml. Detects a band of approximately 35-45 kDa (predicted molecular weight: 35 kDa).Can be blocked with Recombinant Human LYVE1 protein (ab54341). 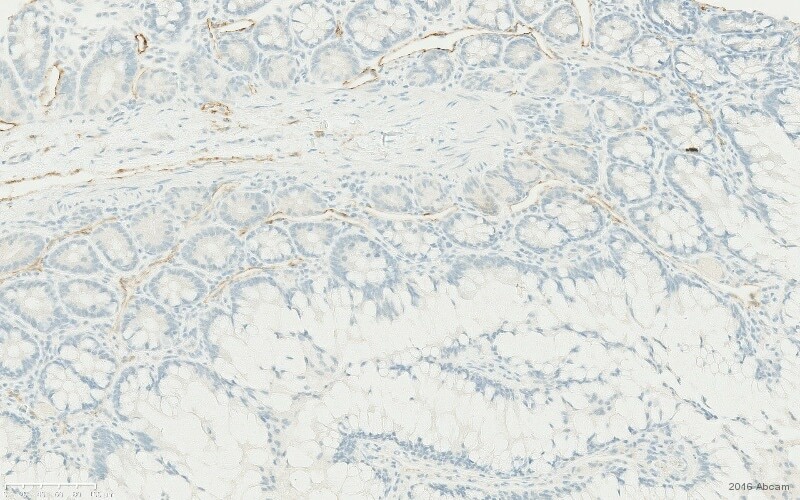 Immunohistochemistry (Frozen sections) analysis of human colon carcinoma tissue sections labelling LYVE1 with ab10278. ab10278 (2µg/ml) staining LYVE1 in human colon using an automated system (DAKO Autostainer Plus). 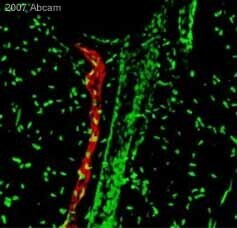 Using this protocol there is lymphatic endothelium staining of lymphatic ducts where blood vessel endothelium and smooth muscle is wholly negative. Additional bands at: 22 kDa, 55 kDa. We are unsure as to the identity of these extra bands. LYVE-1 contains a number of potential glycosylation sites (SwissProt) which may explain its migration at a higher molecular weight than predicted. Flow Cytometry analysis of human dermal microvascular endothelial cells (HDMVEC) labelling LYVE1 with ab10278. Rat skin was fixed with paraformaldehyde in 15% saturated picric acid solution for 4hr. Prior to sectioning, the specimen was infiltrated in O.C.T. and frozen in isopentane. The frozen specimen was sectioned these were rinsed in PBS for 15 min to remove O.C.T. and incubated in a 3% sodium deoxycholate solution. The specimens were rinsed twice with distilled water and then with PBS three times. The sections were incubated in 10% normal goat serum for 12 hr at 4°C, then for 12 hr with ab10278. After washing with PBS, the specimens were incubated with Alexa Fluor® 555-conjugated goat anti-rabbit IgG (H+L) (1:500), for 12 hr at 4°C. The cell nuclei were counterstained with YoYo-1. Images were obtained by using confocal microscope. Publishing research using ab10278? Please let us know so that we can cite the reference in this datasheet. Cell harvesting/tissue preparation method: Digestion in collagenase 1 + DNase I solution. 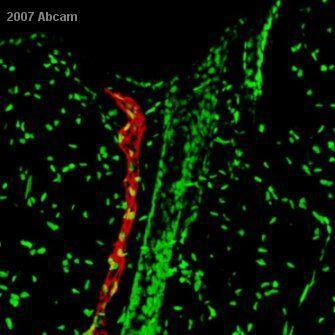 I want to develop an IHC-P staining protocol in prostate tissue for lymphatic vessels using Abcam's LYVE-1 antibody. 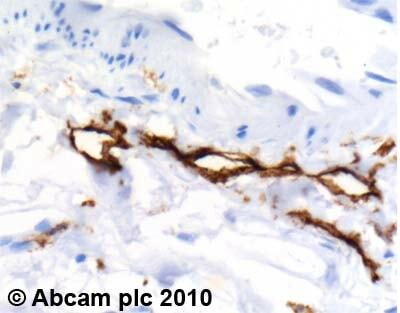 However, before I purchase, I'd like to know if you could send an antibody sample or images of prostate tissue stained with Abcam's clone, ab10278. We recently ordered Abcam's CD11c antibody and were happy with the results, so I hope you can help us again. Thank you for your interest in our LYVE1 antibody ab10278. We do not have any small samples but our guarantee applies to IHC on paraffin-embedded or frozen human tissue. We do not have any data for prostate tissue stained with ab10278 but LYVE1 has been used as a marker for lymphatic vessels in prostate tissue using other antibodies. Antibody ab10278 should be able to detect LYVE1 in prostate as well as it detects LYVE1 in the colon tissue we show on the datasheet, as long as you include a heat-mediated antigen retrieval step. Could you please send me a copy of material safety datasheet (MSDS) forAnti-LYVE1 antibody - Lymphatic Vessel Marker (ab10278), as I cannot find it on your website. We did not have an MSDS beforehands, as the product does not contain any chemicals requiring an MSDS. However we have uploaded now the MSDS for you - you can find it now on the website. https://www.abcam.com/index.html?datasheet=10278 (or use the following: https://www.abcam.com/index.html?datasheet=10278). I hope this is helpful. Please do not hesitate to contact us again should you have any additional questions. 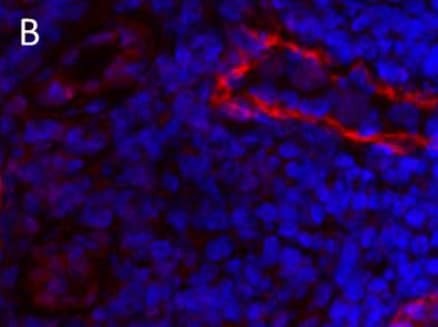 I bought this antibody as a marker for lymphatics in IHC-P samples. We have experienced difficulties and on returning to your site, I see you no longer recommend this antibody for that type of analysis. Therefore I believe I need a refund. My apologies for this problem. Some people indeed have had problems with this antibody in IHC-P (this application came from a customer review) and we believe the antibody may be difficult to optimise, hence we have removed this application from the datasheet. We have had better results with the immunogen affinity purified version of the antibody (ab36993) which has been successfully tested in IHC-P. I have asked our accounting department to issue you a full refund. I hope that this experience will not prevent you from purchasing a product from us in the future as we have many quality products. If you have any further questions concerning your refund, please contact the accounting department at accounts@abcam.com. The technical team is always at your service, should you require further expert advice. BATCH NUMBER 153132 ORDER NUMBER -- NOT SPECIFIED -- DESCRIPTION OF THE PROBLEM No staining SAMPLE Human / Liver Tissue PRIMARY ANTIBODY ABCAM LYVE-1/RABBIT/TBS/TRIED 1:50, 1:100, 1:200, 1:500, 1:1000/ 30 minutes RT followed by 2x5 minute wash DETECTION METHOD DAB+ staining from DAKO ENVISION KIT; POSITIVE AND NEGATIVE CONTROLS USED Used more human liver tissue without addition of primary antibody, but every other step was included. ANTIBODY STORAGE CONDITIONS Aliquotted into 5?L vials at stored at -20 degrees Celsius. FIXATION OF SAMPLE 48hrs with Formalin post-harvest and then 50% ethanol. ANTIGEN RETRIEVAL Tried heat-retrieval with a citrate buffer (ph 6) and EDTA (ph 8). PERMEABILIZATION STEP nil BLOCKING CONDITIONS Used TBS/30 minutes with Hydrogen Peroxidase (1:10 dilution) SECONDARY ANTIBODY DAKO / GOAT ANTI-RABBIT HRP CONGUGATED/ 1:100/ 30 minutes RT; followed by 2x2min wash. HOW MANY TIMES HAVE YOU TRIED THE APPLICATION? 5-6 t HAVE YOU RUN A "NO PRIMARY" CONTROL? Yes DO YOU OBTAIN THE SAME RESULTS EVERY TIME? Yes WHAT STEPS HAVE YOU ALTERED? I have tried using various retrieval methods (note not microwave, I use a boiling method) with different buffers. I have tried an array of dilutions which cause no difference at all. I have tried adsorbing the primary in human serum (suggested in a paper) with no result. Out of ideas! ADDITIONAL NOTES My supervisor who is very experienced in immunohistochemistry is baffled and has personally helped carry out all experiments. It is her professional belief that there is an issue with the primary antibody (LYVE-1) from ABCAM. Thank you for your enquiry. I am sorry to hear that you have been experiencing difficulties with this antibody. I have read through your technical questionaire and I have a few comments. The application of immunohistochemistry was added to the list of applications associated with this antibody following an excellent review from one of our customers. I would like to recommend that you apply the basics of this protocol to your tissues. They employed a 16 hours fixation with a deparaffination in Neoclear, a rehydration in a dilution series followed by a peroxidase block and antigen retrieval in citrate retrieval using the microwave method. I have pasted the protocol that was used below. Of particular attention the reviewer mentioed that "the main concern of this technique are the re-hydration steps; the tissue(s) must never be left to dry, and the re-hydration should be done stepwise (at least 4 ethanol dilutions, 5-10 mins each). For thyroid tumors, blocking with hydrogenous peroxide is also crucial." The protocol is as follows: Use Paraffin enbeded samples - section thickness 3?m - deparaffinate 3 X 5 min in Neoclear (or equivalent) - rehydrate with alcohol (100% -96% -80% -70%, 5 minutes in every solution ) then place in water - block peroxidase in 1% H2O2 /methanol for 5 min. - wash 2 x in PBS, 2x5 min in citrate-buffer / microwave 600 watt - cool down in citrate-buffer for 15-20 min. - wash 1 x in PBS - Wash 2 x with PBS / 0.1%Tween - Incubate with primary antibody (1:400 dillution) overnight (18-20 hours) at 4oC in a humidified chamber - wash 2 x in PBS/0.1%Tween - goat anti rabbit Ab (any source, Santa Cruz for instance) for 60 min. in humid chamber at room temperature - wash 2 x with PBS/0.1%Tween - reveal secondary staining with secondary reagents (any source) - wash under streaming Distilled water (5 min) - counter stain and mount slides If you continue to have difficulty, please get back in touch with me. I bought your antibody several months ago:LYVE1 antibody - Lymphatic Vessel Marker (rabit react with human),code:ab 10278.Now,I want to know that is it can be use to identify the rabbit thoracic duct endothelial cell?Thanks for your answer! Thank you for your enquiry. All the information we have on species cross reactivity is specified on the datasheet, these are updated as soon as any new information is brought to our attention. As far as we are aware, cross reactivity with rabbit has not yet been tested for use with ab10278. Should you decide to go ahead and purchase this product, please let us know how you get on by submitting an Abreview and in return we will award you 50 Abcam Points, which can be redeemed on a number of rewards (a further 100 points will be offered for an image). Please let me know if you require any further assistance. Thank you for your patience and I'm sorry to hear that you are experiencing difficulty with ab10278. Originally, it has not been tested on formalin-fixed tissue sections. However, recently one of our customers has used it successfully on this type of application - you can read the customer's comments by clicking on the reviews tab located on the online datasheet for ab10278. He looked at lymphatic vessel staining in thyroid tumors, using paraffin-embedded material. He used a 1:400 dilution and peroxidase-based method for the detection (like you). He did mention that "the main concern of this technique are the re-hydration steps; the tissue(s) must never be left to dry, and the re-hydration should be done stepwise (at least 4 ethanol dilutions, 5-10 mins each). For thyroid tumors, blocking with hydrogenous peroxide is also crucial." I have included his protocol below: - use Paraffin enbeded samples - section thickness 3?m - deparaffinate 3 X 5 min in Neoclear (or equivalent) - rehydrate with alcohol (100% -96% -80% -70%, 5 minutes in every solution ) then place in water - block peroxidase in 1% H2O2 /methanol for 5 min. - wash 2 x in PBS, 2x5 min in citrate-buffer / microwave 600 watt - cool down in citrate-buffer for 15-20 min. - wash 1 x in PBS - Wash 2 x with PBS / 0.1%Tween - Incubate with primary antibody (1:400 dillution) overnight (18-20 hours) at 4?C in a humidified chamber - wash 2 x in PBS/0.1%Tween - goat anti rabbit Ab (any source, Santa Cruz for instance) for 60 min. in humid chamber at room temperature - wash 2 x with PBS/0.1%Tween - reveal secondary staining with secondary reagents (any source) - wash under streaming Distilled water (5 min) - counter stain and mount slides Have a look at this and let me know what you think. Your protocols are very similar. If you continue to have difficulty, I can offer a replacement vial for you to try. Please let me know.